I liked a lot about this whodunit. First off there were a lot of women in it. The MC was a female police officer who had a female friend, another police officer, as a sidekick. They were investigating a death of a pregnant teenager. Mind you all of them had their problems and flaws which made them very interesting characters and their skeletons in the respective closets were rattling loudly. Allegedly nothing new but it sounded so right and so true. What’s more Joellen wasn’t left in a kind of artificial void. She had a family to take into consideration and a dog, Mojo. She also had a bit of a past. Once again, seemingly nothing out of ordinary and yet many heroines like her have to make do without such a background and so they seem like plastic dolls to me. Although I didn’t have any problems with guessing the perpetrator of the murder, their identity was logical, fitting the rest of the book. The narration was smooth and dynamic – I was able to read the whole novel in one evening. Finally let me say that the copy sent to me was of very good quality and flawlessly edited, another huge asset. If I had to complain a bit or indicate any weak points I’d look at the title. Warped Ambition explains just a bit too much in my very humble opinion, is a tad too suggestive. I would leave it at ‘ Warped’ or change altogether. Also the novel is worth a more captivating cover art – that generic, blurred figure of a woman is too bland. I wish Joellen and her creator all the best and I would love to read the continuation of her adventures. 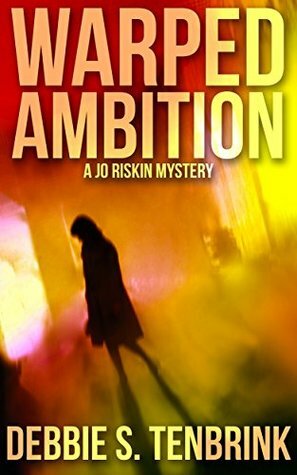 This entry was posted in book review, chicklit, contemporary, crime, mystery and tagged Debbie S. TenBrink, female characters, interesting protagonist, Joellen Riskin mystery, murder mystery, series alert, warped ambition. Bookmark the permalink. Woah. I’m glad it turned out good! These whodunits have a tendency to be meh…especially for me. To be honest I was surprised myself.